HomeFab ForumPaul McCartneyHappy Birthday, Paul! I'm an hour late, but HAPPY BIRTHDAY PAULIE!! I wore my Macca shirt for you today, and I listened to Kisses On The Bottom to celebrate. I can't believe my baby is already seventy-one, I feel so old now. Celebrated all by myself, there are couple of years left before he stops touring, I better hurry. Happy Belated Birthday , Paulie!! I had a cupcake (though no candle) while listening to 'Birthday ', in your honour. I still think of him as being in his 20s most the time, then I have to remind myself that he's 71!! Paul did have a twin -- John. They were born joined at the fretboard. Reminds me of that Elvis story. "71 Paul McCartney Songs in 10 Minutes" for Sir Paul's 71st birthday. What is your favorite Paul McCartney song? Thank you for posting the video! I hadn't heard quite a few of these songs, so it was really nice to listen to. As for favorite Paul song, I honestly can't pick! I am bumping this thread early so the folks who missed this tribute to Paul's 71st birthday will have a chance to hear it before he turns 72 next week. If I spoke prose you'd all find out, I don't know what I talk about. Ooops, the BBC has Paul turning 77 this year. Get it right, people. 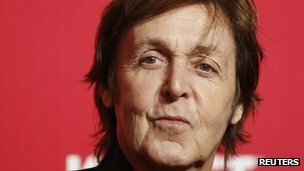 It's Sir Paul McCartney 's 77nd birthday on Wednesday and a group of campaigners will be marking the occasion with an unusual event. Members of the People for the Ethical Treatment of Animals group (PETA) will gather wearing Paul McCartney masks outside The Cavern Club tomorrow. 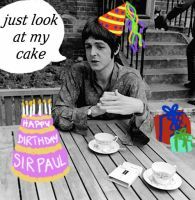 Associate director Mimi Bekhechi said: "We're sure Paul will be delighted that we've chosen to honour his birthday by encouraging the public to give vegetarianism a try." Have a splendid, relaxing day Paul whatever you do. 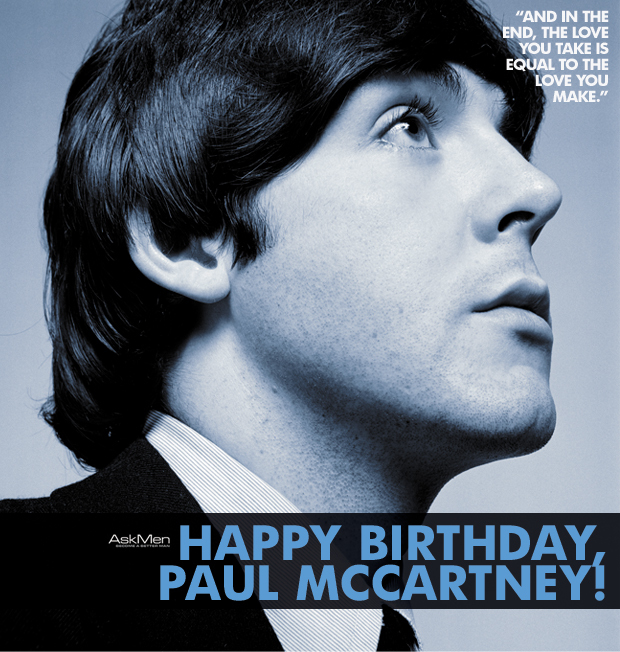 Happy Birthday Paul! Hope he's having a great day, whatever he's doing. Happy b-day Paul! Hope this day is wonderful! Happy birthday, sir Paul! Have a good, relaxing day. If you're lonely (or not! ), you can talk to me. .....Hey! Are you a new member on this fine forum and don't know where to go to introduce yourself? Well, you can do it here! Dig it? but moving and a grooving gonna satisfy my soul. let's buy some more, let's have party tonight. but I can shake a chicken in the middle of the room. bring him in and fill him up and set him on the floor. tell me, pretty baby if you think you feel it too. We're gonna send it to the store, let's buy some more, have party tonight. Oh yeah, we're gonna have ourselves a little party, yeah, yeah, tonight. I'm not giving in, man, I'm gonna have a party, yeah. send it to the store, let's buy some more, we're gonna have a party tonight. but moving and a grooving gonna satisfy my soul, let's have a party. That's right, Paul. No giving in. I hope you party for years to come! Oh, it appears your party started early. Carry on then. Joking aside, keep getting better. Many, many fans are awaiting your return. "We can do what we want, we can live as we choose"